The hearts of all Catholics, beloved, realize that to-day's solemnity is to be honoured as one of the chief feasts, nor is there any doubt that great respect is due to this day, which the Holy Spirit has hallowed by the miracle of His most excellent gift. For from the day on which the Lord ascended up above all heavenly heights to sit down at God the Father's right hand, this is the tenth which has shone, and the fiftieth from His Resurrection, being the very day on which it began, and containing in itself great revelations of mysteries both new and old, by which it is most manifestly revealed that Grace was fore-announced through the Law and the Law fulfilled through Grace. For as of old, when the Hebrew nation were released from the Egyptians, on the fiftieth day after the sacrificing of the lamb the Law was given on Mount Sinai, so after the suffering of Christ, wherein the true Lamb of God was slain on the fiftieth day from His Resurrection, the Holy Ghost came down upon the Apostles and the multitude of believers, so that the earnest Christian may easily perceive that the beginnings of the Old Testament were preparatory to the beginnings of the Gospel, and that the second covenant was rounded by the same Spirit that had instituted the first. II. How Marvellous Was the Gift of "Divers Tongues"
For as the Apostles' story testifies: "while the days of Pentecost were fulfilled and all the disciples were together in the same place, there occurred suddenly from heaven a sound as of a violent wind coming, and filled the whole house where they were sitting. And there appeared to them divided tongues as of fire and it sat upon each of them. And they were all filled with the Holy Spirit, and began to speak with other tongues, as the Holy Spirit gave them utterance." Oh! how swift are the words of wisdom. and where God is the Master, how quickly is what is taught, learnt. No interpretation is required for understanding, no practice for using, no time for studying, but the Spirit of Truth blowing where He wills, the languages peculiar to each nation become common property in the mouth of the Church. And therefore from that day the trumpet of the Gospel-preaching has sounded loud: from that day the showers of gracious gifts, the rivers of blessings, have watered every desert and all the dry land, since to renew the face of the earth the Spirit of God "moved over the waters," and to drive away the old darkness flashes of new light shone forth, when by the blaze of those busy tongues was kindled the Lord's bright Word and fervent eloquence, in which to arouse the understanding, and to consume sin there lay both a capacity of enlightenment and a power of burning. But although, dearly-beloved, the actual form of the thing done was exceeding wonderful, and undoubtedly in that exultant chorus of all human languages the Majesty of the Holy Spirit was present, yet no one must think that His Divine substance appeared in what was seen with bodily eyes. For His Nature, which is invisible and shared in common with the Father and the Son, showed the character of His gift and work by the outward sign that pleased Him, but kept His essential property within His own Godhead: because human sight can no more perceive the Holy Ghost than it can the Father or the Son. For in the Divine Trinity nothing is unlike or unequal, and all that can be thought concerning Its substance admits of no diversity either in power or glory or eternity. And while in the property of each Person the Father is one, the Son is another, and the Holy Ghost is another, yet the Godhead is not distinct and different; for whilst the Son is the Only begotten of the Father, the Holy Spirit is the Spirit of the Father and the Son, not in the way that every creature is the creature of the Father and the Son, but as living and having power with Both, and eternally subsisting of That Which is the Father and the Son. And hence when the Lord before the day of His Passion promised the coming of the Holy Spirit to His disciples, He said, "I have yet many things to say to you, but ye cannot bear them now. But when He, the Spirit of Truth shall have come, He shall guide you into all the Truth. For He shall not speak from Himself, but whatsoever He shall have heard, He shall speak and shall announce things to come unto you. All things that the Father hath are Mine: therefore said I that He shall take of Mine, and shall announce it to you." Accordingly, there are not some things that are the Father's, and other the Son's, and other the Holy Spirit's: but all things whatsoever the Father has, the Son also has, and the Holy Spirit also has: nor was there ever a time when this communion did not exist, because with Them to have all things is to always exist. In them let no times, no grades, no differences be imagined, and, if no one can explain that which is true concerning God, let no one dare to assert what is not true. For it is more excusable not to make a full statement concerning His ineffable Nature than to frame an actually wrong definition. And so whatever loyal hearts can conceive of the Father's eternal and unchangeable Glory, let them at the same time understand it of the Son and of the Holy Ghost without any separation or difference. For we confess this blessed Trinity to be One God for this reason, because in these three Persons there is no diversity either of substance, or of power, or of will, or of operation. As therefore we abhor the Arians, who maintain a difference between the Father and the Son, so also we abhor the Macedonians, who, although they ascribe equality to the Father and the Son, yet think the Holy Ghost to be of a lower nature, not considering that they thus fall into that blasphemy, which is not to be forgiven either in the present age or in the judgment to come, as the Lord says: "whosoever shall have spoken a word against the Son of Man, it shall be forgiven him, but he that shall have spoken against the Holy Ghost, it shall not be forgiven him either in this age or in the age to come." And so to persist in this impiety is unpardonable, because it cuts him off from Him, by Whom he could confess: nor will he ever attain to healing pardon, who has no Advocate to plead for him. For from Him comes the invocation of the Father, from Him come the tears of penitents, from Him come the groans of suppliants, and "no one can call Jesus the Lord save in the Holy Ghost," Whose Omnipotence as equal and Whose Godhead as one, with the Father and the Son, the Apostle most clearly proclaims, saying, "there are divisions of graces but the same Spirit; and the divisions of ministrations but the same Lord; and there are divisions of operations but the same God, Who worketh all things in all." 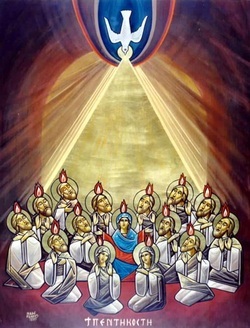 By these and other numberless proofs, dearly-beloved, with which the authority of the Divine utterances is ablaze, let us with one mind be incited to pay reverence to Whitsuntide, exulting in honour of the Holy Ghost, through Whom the whole catholic Church is sanctified, and every rational soul quickened; Who is the Inspirer of the Faith, the Teacher of Knowledge, the Fount of Love, the Seal of Chastity, and the Cause of all Power. Let the minds of the faithful rejoice, that throughout the world One God, Father, Son, and Holy Ghost, is praised by the confession of all tongues, and that that sign of His Presence, which appeared in the likeness of fire, is still perpetuated in His work and gift. For the Spirit of Truth Himself makes the house of His glory shine with the brightness of His light, and will have nothing dark nor lukewarm in His temple. And it is through His aid and teaching also that the purification of fasts and alms has been established among us. For this venerable day is followed by a most wholesome practice, which all the saints have ever found most profitable to them, and to the diligent observance of which we exhort you with a shepherd's care, to the end that if any blemish has been contracted in the days just passed through heedless negligence, it may be atoned for by the discipline of fasting and corrected by pious devotion. On Wednesday and Friday, therefore, let us fast, and on Saturday for this very purpose keep vigil with accustomed devotion, through Jesus Christ our Lord, Who with the Father and the Holy Ghost lives and reigns for ever and ever. Amen.